GPS - Dry Creek Falls, 320m el. 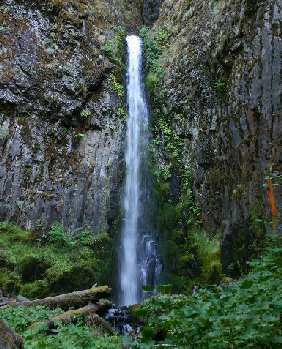 Dry Creek Falls is east of Portland & 0.3 miles from PCT. Locate and head up the road to Bridge of the Gods. Short distance up the road (before the tollgate) turn right into the Bridge of the Gods Trailhead. Walk through the rest area building. Notice a sign across the road. Walk across the road and start up the Pacific Crest Trail. (sign for Pacific Crest Trail South). sign for PCT South on the left and continue up the trail. After little over a mile you will meet up with a powerline road. Turn right and head up the road. path on the left near the trees. across the bridge over Dry Creek. Your goal is to head up the road with the sound of the creek on your left. About a quarter mile is the location of Dry Creek Falls.